I would like to ask that at what distance from the Earth's surface the curvature of the Earth is visible. What layer of the atmosphere is this? I've noticed that at the height of 9-12 Km (the view from from aeroplanes) it is not visible. 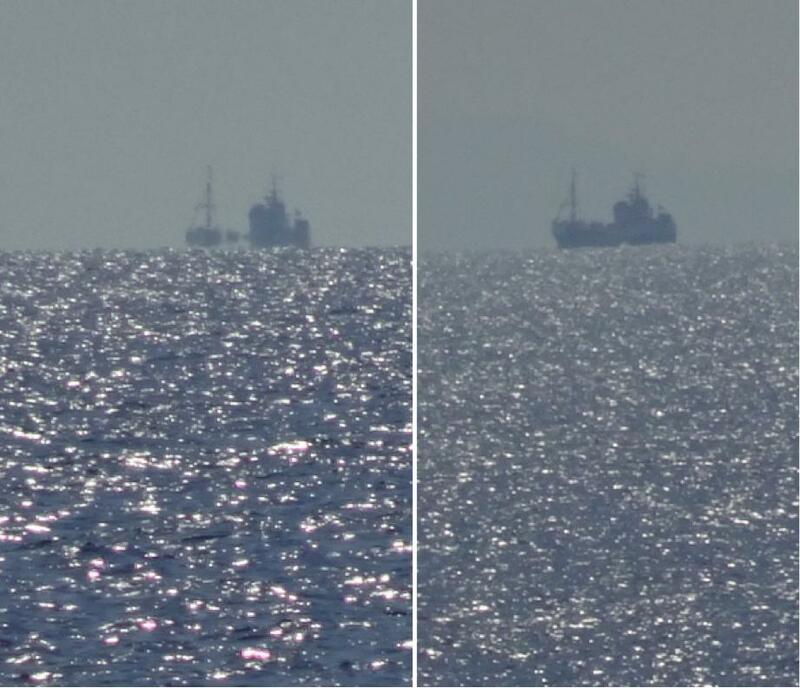 A distant boat seen from 6 m (left) and from 22 m (right) above the sea surface. This boat was about 30 km apart. My pictures, taken with a 30x optical zoom camera. 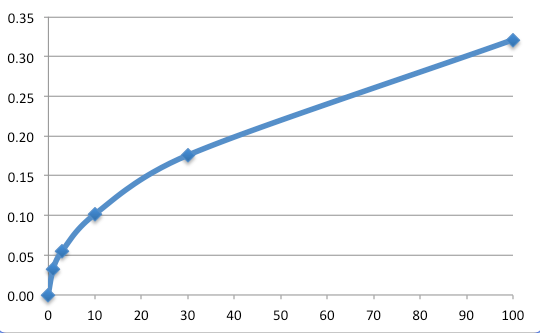 Distance of visibility d (vertical axis, in km), as a function of the elevation h of the observer above the sea level (horizontal axis, in m). From just 3 m above the surface, you can see the horizon 6.2 km apart. If you are 30 m high, then you can see up to 20 km far away. This is one of the reasons why the ancient cultures, at least since the sixth century BC, knew that the Earth was curved, not flat. They just needed good eyes. You can read first-hand Pliny (1st century) on the unquestionable spherical shape of our planet in his Historia Naturalis. Cartoon defining the variables used above. d is the distance of visibility, h is the elevation of the observer O above the sea level. where gamma is in degrees, see the cartoon below. 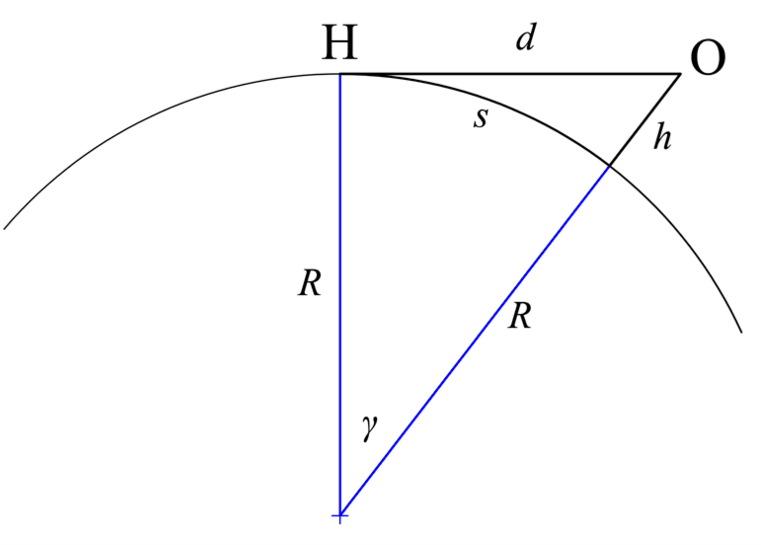 Angle of the horizon below the flat-Earth horizon (gamma, in degrees, on the vertical axis of this plot) as a function of the observer's elevation h above the surface (meters). Note that the apparent angular size of the Sun or the Moon is around 0.5 degrees.. So, at an altitude of only 290 m above the sea level you can already see 60 km far and the horizon will be lower than normal by the same angular size of the sun (half a degree). While normally we are no capable of feeling this small lowering of the horizon, there is a cheap telescopic device called levelmeter that allows you to point in the direction perpendicular to gravity, revealing how lowered is the horizon when you are only a few meters high. When you are on a plane ca. 10,000 m above the sea level, you see the horizon 3.2 degrees below the astronomical horizon (O-H), this is, around 6 times the angular size of the Sun or the Moon. And you can see (under ideal meteorological conditions) to a distance of 357 km. 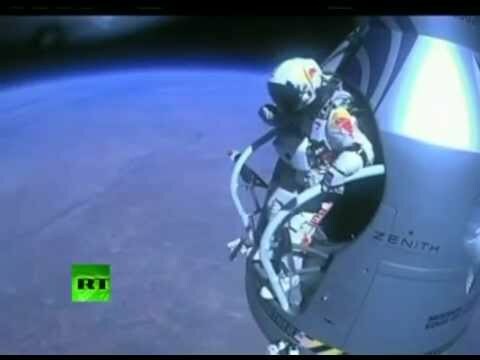 Felix Baumgartner roughly doubled this number but the pictures circulated in the news were taken with very wide angle, so the ostensible curvature of the Earth they suggest is mostly an artifact of the camera, not what Felix actually saw. This ostensible curvature of the Earth is mostly an artifact of the camera's wide-angle objective, not what Felix Baumgartner actually saw. @Mani you can, actually, "change which answer is accepted, or simply un-accept the answer, at any time". You may (but are not, by any means, required) to change the accepted answer if a newer, better answer comes along later. Reports and photographs claiming that visual observers can detect the curvature of the Earth from high mountains or high-flying commercial aircraft are investigated. Visual daytime observations show that the minimum altitude at which curvature of the horizon can be detected is at or slightly below 35,000 ft, providing that the field of view is wide (60°) and nearly cloud free. The high-elevation horizon is almost as sharp as the sea-level horizon, but its contrast is less than 10% that of the sea-level horizon. Photographs purporting to show the curvature of the Earth are always suspect because virtually all camera lenses project an image that suffers from barrel distortion. To accurately assess curvature from a photograph, the horizon must be placed precisely in the center of the image, i.e., on the optical axis. 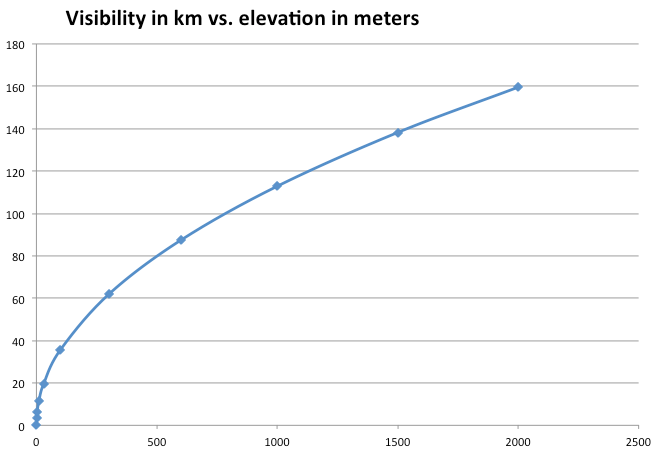 10.7 km is the bare minimum for seeing curvature, so the apparent curvature will be very slight at this altitude. 10.7 km is near the upper end of the usual range of commercial cruise altitudes. Many flights won't get this high, and very few will go significantly higher. A passenger window may not give the necessary 60° field of view, especially if you're over the wing. As the quotation states, you need a nearly cloud-free horizon to perceive the curvature. Lynch, D. K. (2008). Visually discerning the curvature of the Earth. Applied Optics, 47(34), H39-H43. It's hard to see the curvature of the earth from an altitude of 7 miles or 37,000 ft (typical cruising altitude of a jetliner) but easy to see from 250 miles (typical altitude of the ISS). The line of sight from an aircraft at 37,000 feet = 235 miles. That's only about 3.4 degrees of the earth's surface. From the ISS at 250 miles, the line of sight is 1,435 miles, which covers about 19.8 degrees of the earth's surface - much easier to see the curve from this altitude. Most people don't realize how large the earth is compared to the altitude of a passenger aircraft. It's easy to think we're really high up, but comparatively we're just skimming the surface. Commercial aircraft normal maximum ceiling of 13.7 kilometres : The curvature isn't apparent. Concorde's ceiling was 18.3 kilometres, and reports are inconsistent. Some couldn't see the curvature, even though they were looking for it. Some pilots thought they could see it. Some passengers could see it after several glasses of champagne. U2 pilots could generally see the curvature at 23 kilometres, and SR71 pilots could definitely see it at 25.9 kilometres. High up on a peak in Hawaii surrounded by nothing but water in every direction, seeing the curvature can be really quite humbling. As far as the boat theory goes, its not something I'd be able to use considering Im aware of the unnerving sizes of deep sea swells and counting rogue waves, naturally between those the boat is at a low point. Having parents that use to go deep sea fishing often, spending over a week out at sea, the swells are...huge. Is not the amount of curvature available to see reduced by looking at it from a very flat angle - ie multiplied by the sine of that small angle? At 35000 feet the horizon is 229 miles away and 440 miles long, with the maximum field of vision of the human eye of 110 degrees (not attainable in practice) so the curvature depth is 78 miles, but because of the flatness of view, it foreshortens to about 2.4 miles (and much less with a narrower field of view). To resolve 2.4 miles at 229 distance over 440 miles miles is going some, or perhaps about 1 mile or less in practice through a window. Using a telescope does not help as all it does is reduce the angle of the field of view proportionately.